November 22, 1968 Daedra Janel Charles, hall of fame basketball player, was born in Detroit, Michigan. Charles played high school basketball at St. Martin de Porres and college basketball at the University of Tennessee. In 1991, she won the Margaret Wade Trophy as the best player in women’s college basketball and was a finalist for the Woody Hayes Award as the nation’s most outstanding student-athlete. Charles also earned her bachelor’s degree in child and family studies that year. From 1991 to 1996, Charles played professional basketball overseas. From 2003 to 2006, she was an assistant coach at the University of Detroit Mercy. She is currently director of character development for the University of Tennessee’s women’s basketball team. 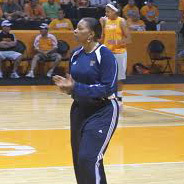 Charles was inducted into the Women’s Basketball Hall of Fame in 2007.